Learning how to calculate slope is as easy once you know what the slope of a line means. If you need some help with this, take a look at GradeA's page dedicated to understanding slope. In a nutshell, the slope of a line is simply the change in the y-values vs. the change in the x-values. The graph of the line . Any 2 points on the line. A table of points on the line. The equation of the line. When you have a graph, you first need to identify 2 points on the line. Look at the line we have drawn in the figure below. The arrows identify our two points. Please note that you can pick any two points on the line (there are a lot to choice from) but we usually like to pick points that fit nicely on the grid so that our numbers are "nicer." There are many more points that you could choose, but these work well. Also, please notice that the first point is the y-intercept. which is shown in green on the graph. There is another way that you can calculate slope from a graph. Take the two points that you found, (0, 2) & (3, 4), and use them in the slope formula given in the next section. x1 means "the first x value" and x2 means "the second x value"
y1 means "the first y value" and y2 means the "second y value"
Once you have the points labeled, carefully substitute them into the formula. Now that you have your fraction, you can leave the slope like that or you can convert it to the decimal 2.5. Either answer is fine. Please be aware that you may see the slope formula written in a couple different ways. Do not be alarmed, you can calculate slope many different ways and they all give you the right answer! Choose any two points from the table - usually we just take the first two. Label them the same way we did here. Check out the figure below. Now, all you have to do is plug the points into the slope formula. Go ahead and try to do it on your own before you look below. The slope should be 2. Did you get that? I bet you did! Use your equation to generate two points. The easiest way to do this is to form a T-Chart like the one below. The T-Chart helped us to find two points that are a part of our line. In this example we found the points (0, 2) & (1, 5). 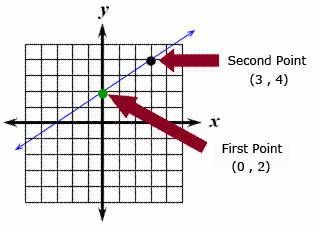 Again, once you have your two points, we can find the slope by following the procedure for calculating slope when given 2 points. Were you able to correctly find the slope? Of course, if your equation is in slope-intercept form, the slope is the value next to x. If your equation is not in slope-intercept form, you can solve for y and then the slope will be the number next to x. For this equation y = 3x + 2 is in slope intercept form. The number next to x is the slope - so slope = 3. You just learned how to calculate slope in four different situations. Want to know how to graph lines? View GradeA's graphing linear equations page.